We woke up on Monday to a sea which was perhaps even worse than Sunday. We were still a fair distance away from site A and were not scheduled to reach site A till approximately 2100 Monday evening. Due to the rough seas I spent the majority of the day hugging my toilet bowl, but not before making the rookie mistake of blocking my sink with the remains of my breakfast, which Geoff the Steward was not too happy about. Due to a day spent in transit not much happened, and due to my sea-sickness I was not around to see what did, therefore I thought it would be a good time to introduce the reason why we’re rushing towards the Celtic Sea at a slow and steady speed of seven knots. Although shelf seas make up only 5% of the ocean surface, they have been estimated to be the most valuable biome on earth, with high levels of primary productivity supporting diverse ecosystems. 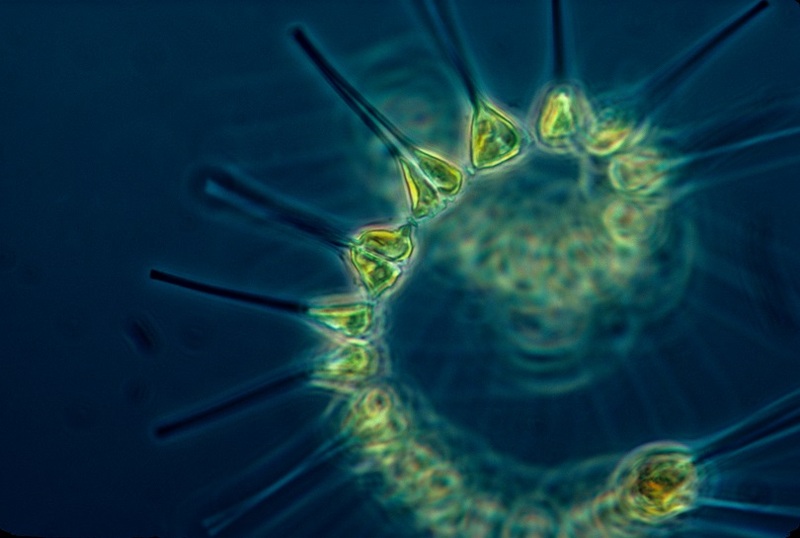 High concentrations of nutrients support the growth of phytoplankton, which are single celled marine organisms that photosynthesise like plants on land. Like plants on land, Phytoplankton are the base of the marine food web and they provide a diverse food source for many marine creatures, such as zooplankton. Zooplankton are tiny marine animals which are food for fish and countless other marine organisms, that are then in turn eaten by others. It is in this way that the sun’s energy fixed by phytoplankton on the surface of the water column is distributed throughout the marine ecosystem, underpinning more than 90% of global fisheries and offering many other important ecosystem services. In addition to supporting the entire marine food web, the photosynthesis carried out by phytoplankton also removes significant amounts of carbon dioxide from our atmosphere. Although tiny, phytoplankton have a disproportionately massive effect on our atmosphere, and are responsible for creating as much as half of the oxygen that we breathe, removing an equally large amount of carbon dioxide as they do it. Some of the carbon extracted by the phytoplankton will sink to the sea floor and be stored in the sediments (often for thousands of years! ), reducing the overall concentration of carbon dioxide in our atmosphere. In order for the shelf seas to sustain these high levels of production, the phytoplankton must be supplied with nutrients, but where do these nutrients come from? It is the need for us to better understand the role of shelf seas in the global nutrient cycle, how this supply of nutrients determines the shelf’s primary and secondary production and how this affects other processes such as carbon storage which has led to the Shelf Seas Biogeochemistry programme. At 2100 on Monday night we reached site A and decided that the seas were too rough to sample that night. Therefore, an 0600 hours CTD cast was scheduled for the following morning, and we were hopeful that our cruise was about to get its first piece of data. For those of you wishing to see the answer to yesterday’s question, the answer is Richard Cooke of the National Oceanography Centre, Liverpool. Deployment of SPI camera to the ocan's seabed. What is happening in the benthos? Deploying the large yellow torpedo!